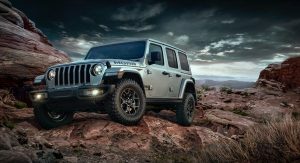 Jeep has lifted the wraps off the 2018 Wrangler Moab Edition, a more extreme Sahara-based model that packs more features aimed at improving off-road behavior. 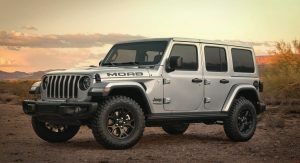 Riding on 17-inch Low Gloss Black aluminum wheels shod with 32-inch mud-terrain tires, the Moab Edition looks more rugged than the Sahara model it’s based on, thanks also to the Rubicon hood with unique Moab decal, premium off-road rock rails, and steel bumpers with removable end caps. More subtle standard features include the LED headlights and taillights, Low-Gloss Black headlight surrounds, grille throats and tow hooks, and the body-color hardtop — although the Dual Top Group or Sky One-Touch power top are also available. 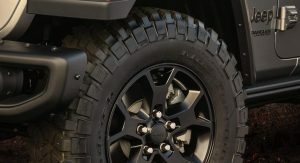 For no extra cost, customers can opt for the Sahara side steps as well. 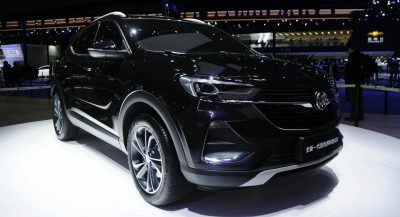 Nine exterior colors will be offered, including Granite Crystal, Billet Silver, Punk’n Metallic, Mojito!, Black, Bright White, Sting Gray, Ocean Blue Metallic and Firecracker Red. 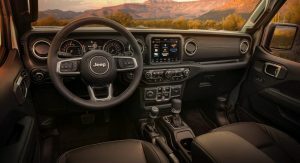 Inside, the 2018 Wrangler Moab Edition brings goodies such as the Leather Interior Group (leather seats and dashboard with contrast stitching) and Safety Group, which bundles assistance technologies including Blind-spot Monitoring and Rear Cross Path detection, ParkSense park assist with reverse stop, and ParkView rear backup camera with dynamic grid lines. 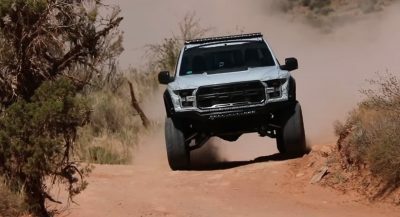 The list of standard features continues with the Selec-Trac full-time 4WD system with a two-speed transfer case, Trac-Lok limited-slip rear differential, 8.4-inch Uconnect touchscreen with navigation, a nine-speaker premium Alpine sound system, and all-weather slush mats. 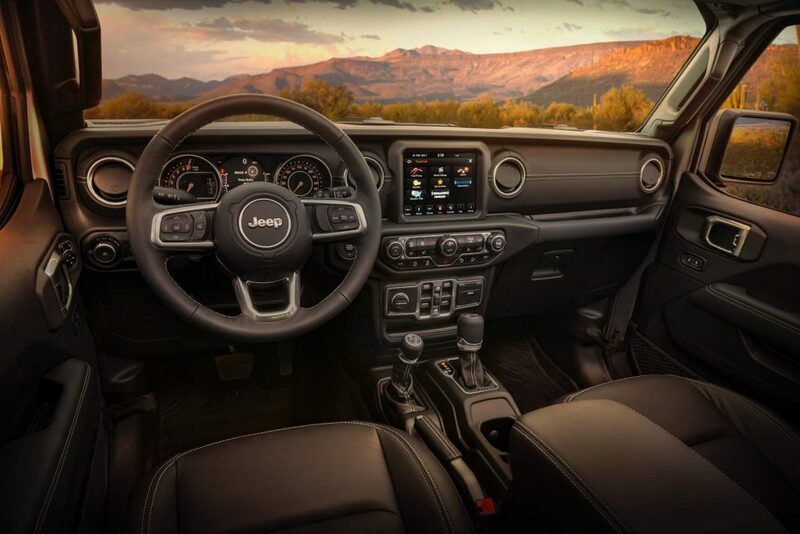 For those who want a better-equipped Moab Edition, the available Cold Weather Group adds heated front seats and steering wheel, remote start, Trailer Tow, and the Trail Rail cargo management system. 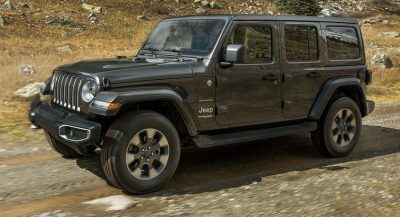 Prices haven’t been announced yet but an ordering guide leaked earlier this month revealed an additional cost of $10,905 over the base price of the four-door 2018 Wrangler Sahara, bringing the total to a whopping $51,200 before options. 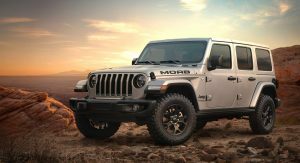 Since the Moab Edition is essentially a more rugged Sahara, it gets the same 3.6-liter V6 engine rated at 285 hp and 260 lb-ft (352 Nm) of torque, mated to a standard eight-speed automatic transmission (a $2,000 option on the Sahara). 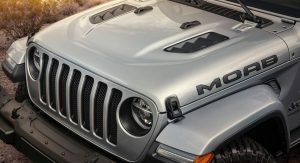 So in 10 years we’ll have a $70k Jeep from the factory?? 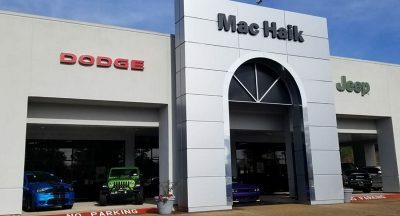 Meh, for that price just get a fully loaded Rubi. That’s what I did. More off road ability than the Moab with the same creature comforts. 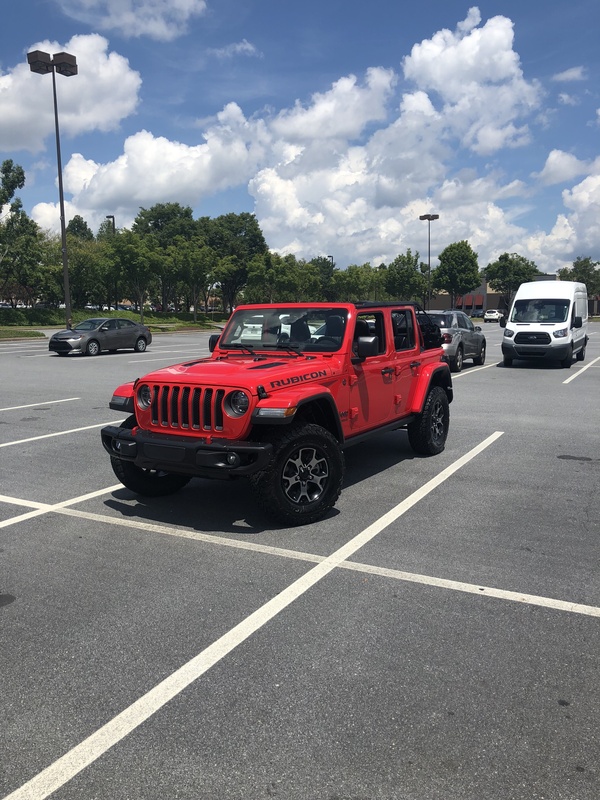 Agreed, even though the MOAB has a Selectrac gearbox, it still has that 3.45 gear ratio in the axles while the Rubi has lockers and sway bar disconnects. The Sahara, even in MOAB guise, is still the mall crawler of the bunch. 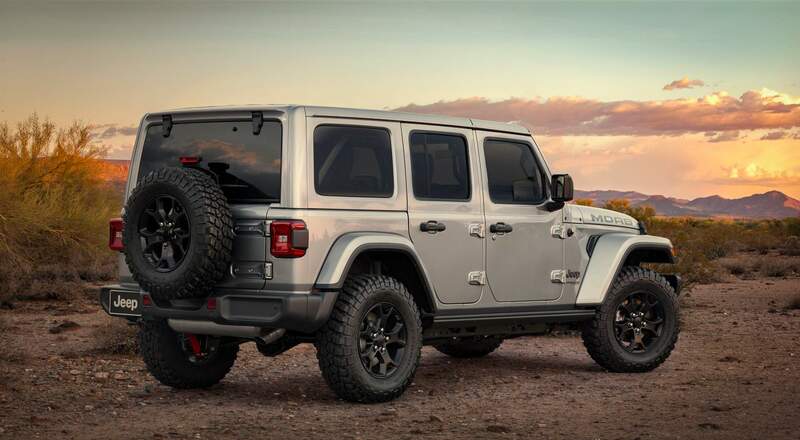 Don’t know why Jeep made MOAB based on Sahara not Rubicon…. They call it MOAB without lockers? What are they drinking at FCA?